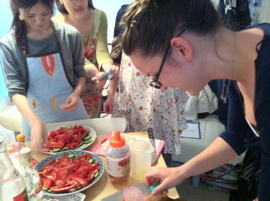 My Eyes Tokyo brings you interviews with teachers from “Niki’s Kitchen“. 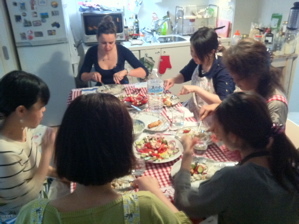 It’s a cooking school in which foreigners teach their homeland dishes to Japanese people. This is a story about the first Serbian whom we met in our life: Jelena Jeremic, a young, cheerful, intelligent and humorous woman. She loves telling jokes all the time and she keeps the smile on her students’ faces during her classes. You can learn how to cook Serbian and Greek dishes, learn about the culture, history and people from the Balkans in an enjoyable and vivid atmosphere. We’re sure that this girl will challenge everything you thought you knew about Serbia – a long ago war-torn country – once you meet her. We guarantee it! 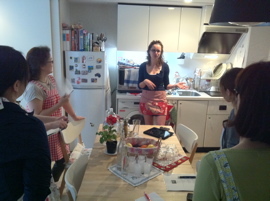 *Click here to learn about Niki’s Kitchen. In Serbia, dining out is not that common like it is the case in Japan. We dine out only for special occasions. 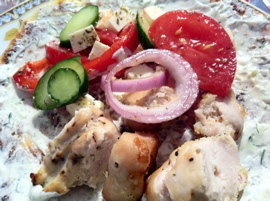 We love to have homemade food and that’s what we are taught is the healthiest. My grandmother always told me “Health comes from a spoon”, meaning that homemade dishes will make you live a long and healthy life. Before coming to Japan, I knew that Tokyo is one of the cities that cherishes diversity and indigenous food culture more than any place on Earth. But I had no idea that there were so many girls who were actually interested in learning how to cook. After one year cooking for other cooking schools and our students, my first cooking school owner told me: “I think you could be really good at this. You should try out Niki’s kitchen. She is the best.” I ran a search for Niki’s Kitchen on Google and I found her article on My Eyes Tokyo (*click here to read it). I was really impressed by her philosophy and decided to join the school. She seemed like a warm person who loved making links between cultures and knew how to cherish its originality. The persons whom I owe the biggest thanks for cooking the way I do and for being able to maintain the tradition of homemade cooking are my grandmothers. Both of my grandmothers are very good cooks. I had this special thing for food and cooking from my very early childhood. My childhood memories are very much linked to the scent of baked pie, bread, homemade soups, a variety of meat and vegetable dishes that were made straight from the oven every day for the family. By the time I was a university student, I was already cooking for myself a lot. I like experimenting with food. 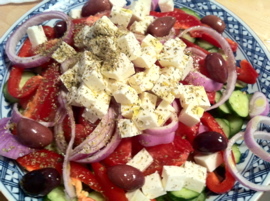 During my studies of the Italian language, I started being interested in Italian cuisine and that was enriched by the appearance of my Greek husband who brought to my cooking the breathtaking smell of Mediterranean food. 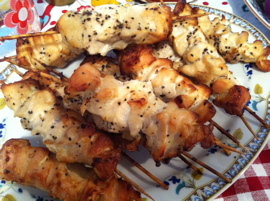 Today I enjoy cooking for him and my friends in Japan, Greece and Serbia whenever I have the chance to do so. It is wonderful how food has the magic to connect people. 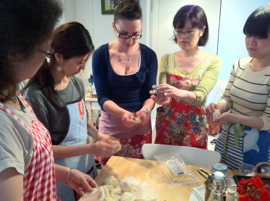 Her class is not only enjoyable but also practical-minded. After coming to Japan, I was sorry to see that many people here still associate Serbia with wars and that many people are quite familiar with Yugoslavia which has not existed for a long time now. I was born in 1985 in Belgrade, the capital of Serbia, and have lived there during three crises – the Yugoslav Wars, Kosovo crises and NATO airstrikes. Unfortunately, once a country is associated with a bad image, it takes a long time and a lot of effort to change that. My country suffered a lot and is still a victim of the past. Being a daughter of a colonel makes me have a different perspective of all that happened. Hopefully, people will have the chance to see the real Serbia: a country which has an open heart. My wish is to show what Serbia and the Balkans really are: a country and region of rich cultural heritage, abundant cuisine, generous people and a lively spirit. 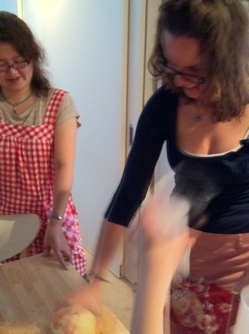 Jelena suddenly slammed a dough against the table! “Footloose and fancy-free”, that’s her cooking style. Serbia has always been a kind of a “cultural crossroad” between the Orient and the West for a long time. 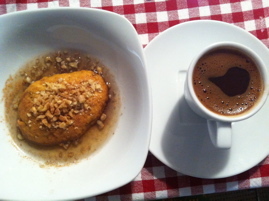 That is what makes the food and culture so rich, various and people familiar with foreigners and foreign cultures. Comparatively, I think people in Japan are still isolated from other countries both in terms of geography and mentality. I feel there’s a wall between the foreign and Japanese community. That’s why I really respect what Niki’s Kitchen philosophy is. Niki-san (Naoko Tanase, a representative of Niki’s Kitchen) has been building a bridge between people of Japan and the world through cooking, which is one of the most beautiful still very challenging things to do in these waters. That’s another challenge for me: explaining to my students that borders are just imaginary lines in our heads: they do not mean that where one country’s border finishes, the culture changes as well. I can understand why my students think like that because Japanese borders are both geographical and cultural: it’s an island. For example, they tend to think Hungarian and Serbian culture and cuisine should be totally different because they are different countries. But let’s imagine we just erase those borders in Europe… does it mean that we are the same or we are totally different? Not really. Especially in Europe, we should look at the countries’ culture as a rainbow… slowly and gradually changing from one color to another. We all share the same history and fairly same culture. 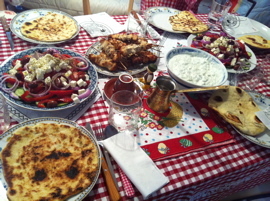 A full-course of Greek home cooking! 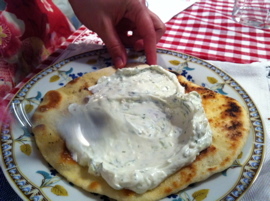 She can teach how to make both Serbian & Greek cuisine. Japan is a very nice country to live in: it’s safe, clean, organized and people are fair. If you find a place to belong and friends here, you’ll feel that Japan is the place to be. What I will surely bring as a lifelong experience is Japanese devotion to work or things of interest. The Japanese love for details and perfectionism never stops to astonish me. I will bring with me Japanese professionalism and perfectionism, Japanese discipline and teamwork; social awareness, as well. There are so many things that I’ve learned from Japanese people. But I’ll never be quiet! That’s something that is a part of my culture, mentality and something that distinguishes me as an individual. I have the opportunity to do here the things I really love – teaching languages & cooking and promoting the culture at the same time. That’s really important. It’s an opportunity to share the love for food and cooking. Niki’s kitchen offers me a framework to promote my origins and hopefully make people love my country by liking me or my food. Break the common prejudices by showing how we can easily find the common language sharing the love for food. Also it’s a bridge between me and Japanese people, an opportunity to explore our differences and have fun along the way. I feel really grateful for that.